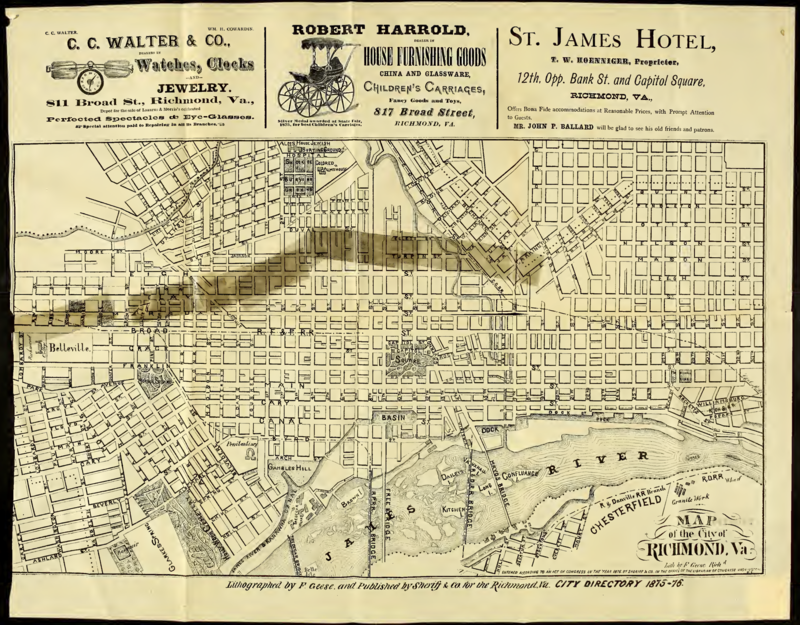 The first map is from the 1875-1876 city guide published by Benj. R. Sherrif, a listing of Richmond residents and businesses by name and location (like the Hill Directories). A century before the construction of Interstates 64/95 and the Downtown Expressway, this map shows a Richmond which only stretches as far north as Venable Street and west to Lombardy Street. The streets north of Leigh are labeled as Mason, Nelson, Otis, Pendleton, and Quince; Jefferson Avenue does not exist. The route of the Church Hill Train Tunnel is drawn across the neighborhood. A map from the 1906 Hill Directory shows the then-recently-annexed town of Fairmount to the north of Church Hill and Cowardin’s Addition and Fulton to the east. Notable also are the appearance of Jefferson, Chimborazo, and Libby Hill parks. In the seven years after the top map was drawn, the great divide at the southern edge of Union Hill was filled and graded to create Church Hill Avenue (later renamed Jefferson Avenue in 1905). Thanks for Cowardin’s Addition! I know the land was owned by Cowardin… didn’t know he had an addition… so.. more research is needed. The business listings on the 1876 city directory are not to be missed! One coffee maker, 40+ butchers (listed by stalls at market 1 or 2), about 12 folks on the staff of MCV. Only two brewers listed, on being Yeungling “next to rockets landing”!